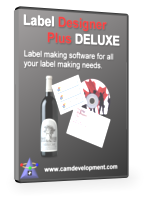 CAM Development - Design and Print Software Products. Welcome! 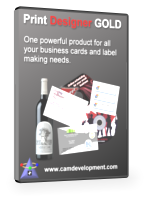 Here you will find our design and print software products, Business Card Designer Plus, Label Designer Plus DELUXE, Print Designer GOLD and Mail Label Designer. Each is designed for a specific set of printable items, with Print Designer GOLD combining the functionality of all the others and then some. 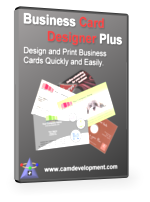 Business Card Designer Plus lets you design and print business cards only, while Label Designer Plus DELUXE includes just about everything else, but not business cards. That includes mail labels, shipping labels, address labels, envelopes, name badges, id cards, post cards, labels for jars, bottles, file folders, cd, dvd, general purpose labels; you name it. 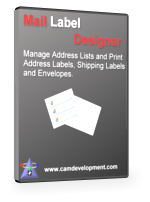 Mail Label Designer is a single purpose product for making mailing labels and envelopes quickly and easily without a lot of fuss. Print Designer GOLDcombines everything for a one-stop experience with full page designs and advanced features, including automation using command line paramaters. You can see a feature comparison here. Super Easy - Add addresses, Select a template, Print!